We are currently seeking qualified judges. If you feel that you have what it takes to judge Pagosa’s best green chile, please drop us a line on our contact page or email jacqueads@gmail.com. PAGCC’S MISSION IS TO BUILD COMMUNITY IN PAGOSA SPRINGS AND THE SOUTHWEST WHILE CELEBRATING OUR HISPANIC CULTURAL HERITAGE THROUGH LOCAL CUISINE AND MUSIC. Each year the fall season arrives with shorter days, cooler nights, and bushels of fresh roasted green chiles. In Pagosa Springs there is an annual green chile cook-off where chefs of all abilities and backgrounds compete for cash, trophies and bragging rights. This event, the Patty Aragon Green Chile Classic was created by Jacque Aragon; Patty’s daughter to celebrate the green chile harvest and to pay homage to a local green chile enthusiast who sated Pagosans’ green chile palettes for years with her tasty homemade recipe. 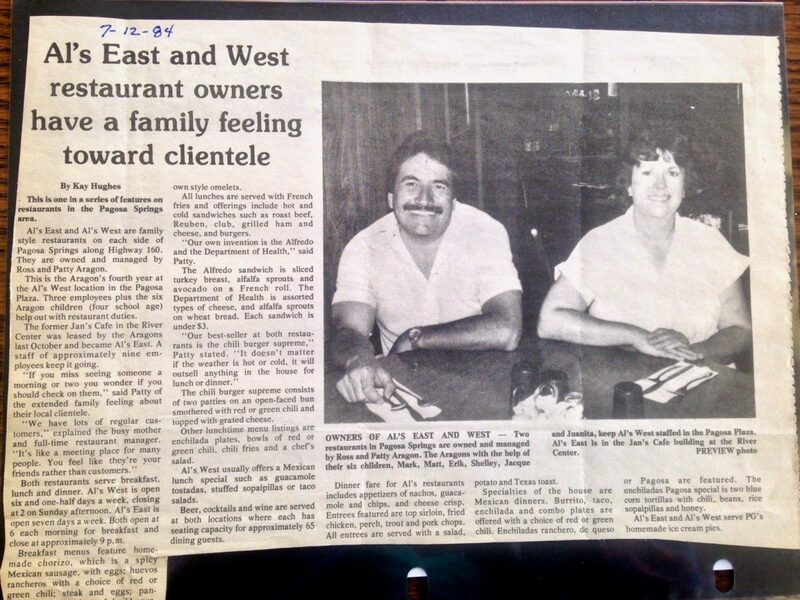 Patty, who passed away 18 years ago, was locally famous for her green chile, often served on burgers and fries at Al’s Café, a restaurant she ran and owned with her husband, Ross. They served traditional American and Southwestern cuisine and were most famous for their green chile, which they served straight up or atop burgers, fries, and almost everything. When they closed their doors in 1992, it was the end of an era for many Pagosans. Several local restaurants have kept the green chile tradition alive and well here in town, along with legions of home cooks who continually strive for the “perfect” green chile recipe. Roughly 40 entrants, both amateur and professional, compete each year in the cook-off. Some cooks get creative; others go classic style. Without their generous contribution of time, effort and ingredients, this community event would not be possible. Entry fee and form are due prior to Saturday, along with $10. Cooks are required to show up with their crock pots and ingredient lists between 10:00-10:30 am in order to start the official judging on time. Three judges volunteer for the difficult and filling job of choosing their favorite chiles. 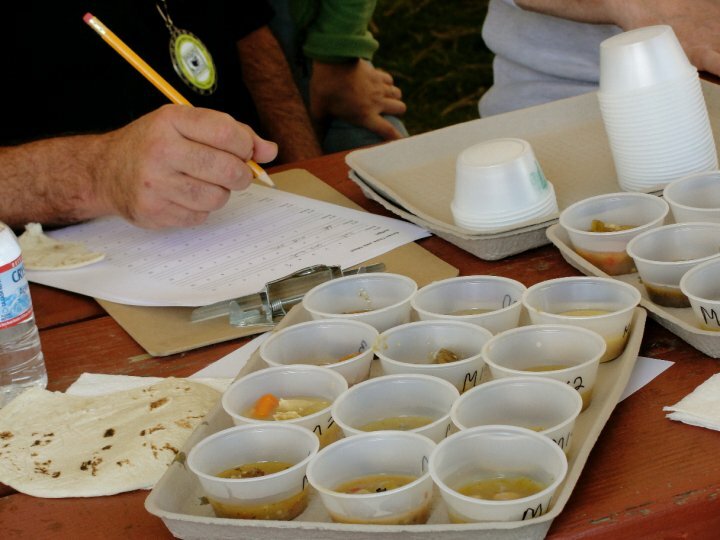 Each judge tastes all chiles present and rates them on a scale from 1-10, plus takes notes in case the scores are close. Then the scores are added up and monies are awarded to first, second and third places in meat and vegetarian categories. Once the judges are finished, the tasting is opened up to the public, who by this time have created a formidable queue. Each person who participates in the tasting and pays $10 is entitled to ten tastes and a vote for the People’s Choice Award, which is the most votes overall at the end, when the chile has been consumed. Some people prefer scorching hot chile, others like it mild; some cooks use chicken, others use pork or no meat at all. No matter how you make your green chile, you’ll have a chance to show your stuff in September and possibly win some cash or a trophy and the undying admiration of local green chile aficionados. More information and complete rules will be available within the next month, but for now – save the date!